Good evening all!! I have had a tremendous response from my brush sets. In the 1 week since I've started to submit the brush sets to 4shared and Deviant Art, over 1600 downloads. Wow! I hope you guys are putting them to good use! 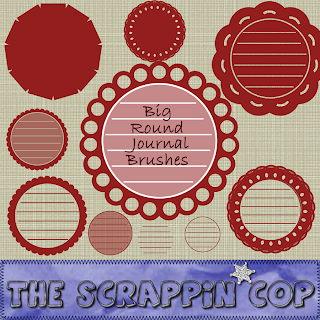 Plus, my brag book pages at RAK Scraps have over 200 downloads. So to celebrate this, (because Cubs lost yesterday and I had to take the "W" flag down - nothing to celebrate there), I will share my newest brush set. The .abr file contains HUGE (almost 2500 px ea) round journal shapes and some line brushes to layer on top or inside the frames. Or, use the erase mode to stamp the lines in the shape so the background shows through. Just play with them, use them and abuse them, grunge them up, apply layer styles and pattern fills. I would love to see what you do with them! I know everyone says that and probably never get a link to a gallery to see what is created but it would inspire me to see everyone's use of the sets! The comments left also are so kind and very much appreciated! Since it is time for me to focus on the ballgame I'll just post the freebie and check in again soon! I would really really love to have these, but the link isn't working right now. Beautiful work though! I fixed the link, thanks for letting me know!